Fullerton Paint & Flooring carries an extensive line of high-performance industrial paints to coat a wide range of surfaces. Our heavy duty industrial coatings are ideal for protecting metal, concrete, wood, and composite surfaces from corrosion, abrasion, moisture, and repeated impact from machinery, forklifts, and other vehicles. With the right coating, your surfaces will be more resilient, more durable, and longer lasting. At Fullerton Paint & Flooring, you'll have access to industrial paint and coating products from leading brands, such as Ellis Paint, International/Devoe, PPG Americoat, and Rust-Oleum. Among our diverse inventory are a wide variety of epoxies (high-build, normal, mastics and low temperature formulas), urethanes (aliphatic, aromatic and waterborne), rapid-dry enamel, direct-to-metal (DTM) coatings, 100% solids epoxy floor coatings, chlorinated copolymer coatings, acrylic enamels, and more -- each designed to protect specific surfaces, such as floors, walls, storage containers, machinery, and roofing. We also carry related products for the entire coating process, from strip solvents to final-phase sealers and topcoats. If you aren't sure what you need, our knowledgeable staff has the expertise to help you select the most appropriate solution or system for your needs. We consider a variety of factors, including surface type, budget, goals, and environmental conditions, such as exposure to chemicals, temperature fluctuations, corrosive materials, and moisture, in order to make the best recommendation possible. We can also match Original Equipment Manufacturer (O.E.M) coating specifications for machinery, tools, and vehicles, or recommend specialty coatings for specific operations. 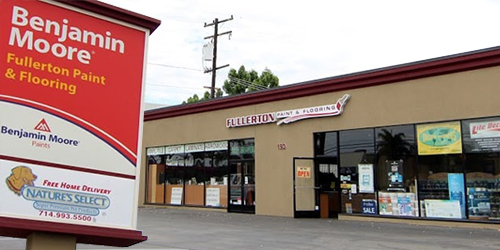 Call or visit Fullerton Paint & Flooring today. We are located in Anaheim, California, and dedicated to being the best source for high-performance industrial coatings in Orange County. Local pick-up and delivery are available, and we offer preferred customer and volume discounts.